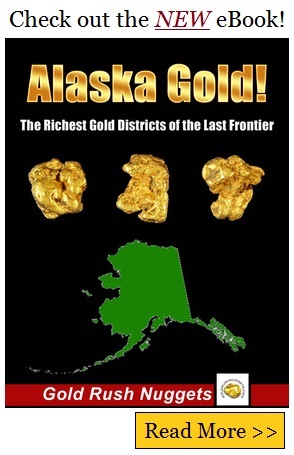 Although it is far from being the largest gold mining region in Alaska, the Gold Rush television show on Discovery Channel has brought considerable attention to this isolated mining district in southeastern Alaska. The first discoveries in this district were made in 1898, in gravels along Porcupine Creek northwest of Haines. Porcupine Creek itself is a tributary of Klehini River, another area where a considerable amount of gold has been found. Recorded placer finds in the Porcupine District occurred in Clear Creek, Glacier Creek, Cahoon Creek, McKinley Creek, Porcupine Creek, Klehini River, Cottonwood Creek, Nugget Creek, Takhin River and Klukwan, a native village near the mouth of the Klehini River. However, by the 1920s, the only placers that were regarded as workable were those in the Glacier and Porcupine drainage basins. At this time in history, gold prices were depressed and only the richest grounds could be worked profitably. Mining activity at that time was confined to Glacier Creek, Porcupine Creek and its main east tributary McKinley Creek. Cahoon Creek, which is also part of the Porcupine Creek drainage basin, as well Nugget Creek, bore significant gold production as well. Along with gold, galena, magnetite, chalcopyrite, pyrite and arsenopyrite can be found in Porcupine Creek and its tributaries, which area all used as indicator minerals for potential hidden gold deposits. Mining operations have been sporadic in Porcupine District during the past century, with the most active period taking place during 1900 to 1906. In that time, the mining district produced an estimated $100,000 worth of gold per year. Through 1959, a total of 53,250 ounces of gold had been produced, all from placers. Placers in this district are made up of creek gravels, side benches and high benches. The quality of gold found in these placers is generally well worn, of a bright color and medium fineness. The size of gold particles found here varies from nuggets weighing several ounces to flour gold. In the past decade, with the price of gold increasing significantly from the low prices during the 1990’s, there is once again mining activity at Porcupine Creek and the surrounding tributaries. Nearly all of the easily workable mining ground is claimed within this district. Although gold prices have gone down significantly from the peak near $1900 per ounce a few years ago, there are still many placer operations that are profitably working in this area. Still, operation costs are exceptionally high in this remote mining district. Like much of Alaska, finding gold is not necessarily difficult, but mining it profitably can be a challenge even for the most experience gold prospectors.